Near to the entrance of the old part of the village of Frigiliana is this rather splendid coin-in-the-slot “mechanical theatre”, known as La Casita de Información y La Fantasía (The House of Information and Fantasy). You might remember these old-fashioned machines from when you were a child – you know the kind, where your coin makes the clown inside laugh manically? Well, the one in Frigiliana isn’t an old machine, but a more modern version, crafted in the old-style way by a collaboration of artists known as Arte-matico de Bernado y Amigos. There are two quite large mechanical theatres back-to-back within the casita, both featuring marionettes, with one entitled “The Moor and his Parrot” and the other “Carmen and Dolores”. If you were to put your 1 Euro coin into the slot (it’s 2 Euros if you’re a millionaire! ), the former will talk about the history of Frigiliana, whilst Carmen and Dolores, depicting two old ladies from the village, chat together about “the good old days”. So, what about the peep-show, I hear your scream? 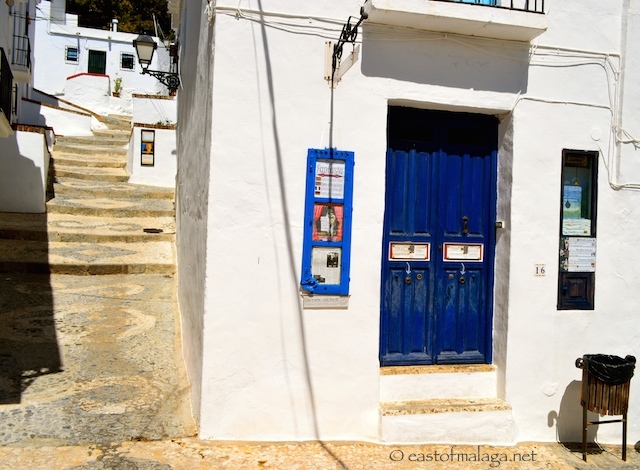 Well, you’ll have to climb up the steps to the upper part of Frigiliana and, as you wander along Calle Alta, keep a look out for this blue door. Can you see the peep-holes? This time you have a choice of two peep-shows in the door – El Milagro de La Vida (The Wonder of Life) or La Esfera Mágica de Cristal (The Magic Crystal), and the good news is, that even if you are a millionaire, the price is just 20 cents! The third show, to the right of the blue door will set you back 50 cents (also with no additional cost for rich folk) and this is called The Marvellous Seaview (Merveilleuse vue sur mer). 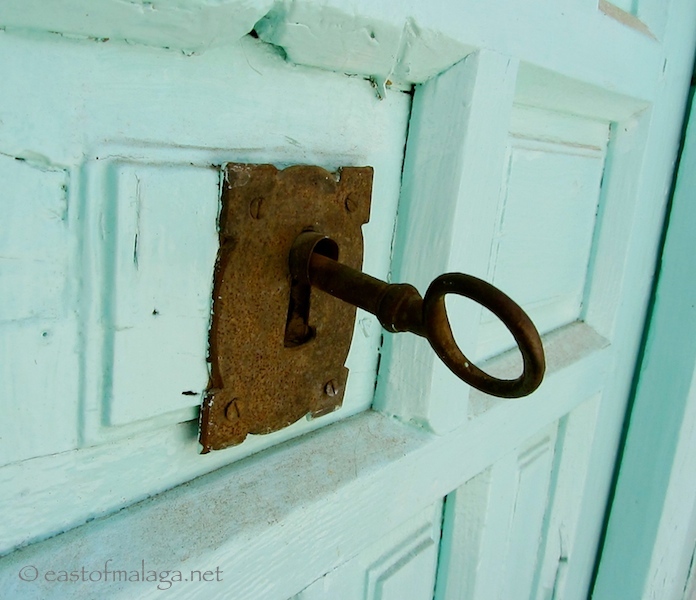 Did you notice the sign on the wall, up the side street beside the blue door? 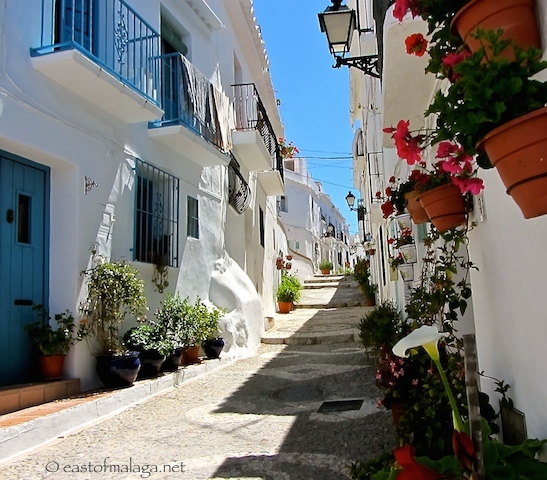 Well, here is the fourth (and final) peep-show in the upper part of Frigiliana village – The Fantastic Harem (Harem Fantastico). This time, for us poor folk, the cost is 50 cents, (there is a reduced rate of 20 cents – but it’s not very clear how you qualify for that), whilst once again, the millionaires have to pay one Euro. What’s the cheapest peep-show YOU’VE ever seen? On second thoughts – don’t answer that! 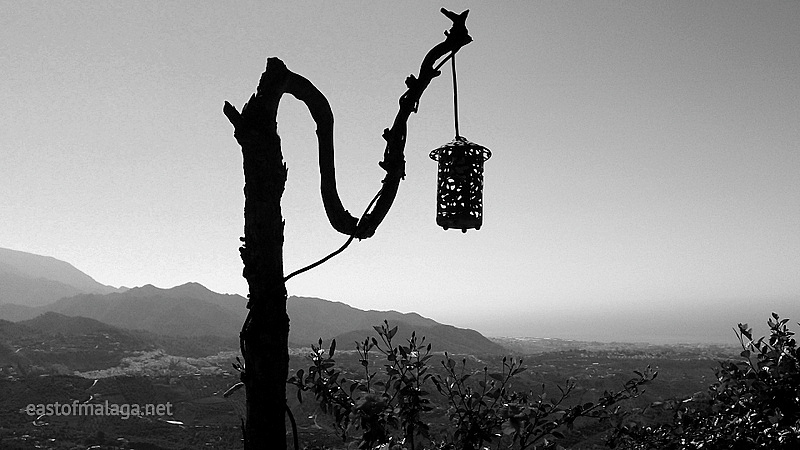 I’ve never posted any black and white photos before, but I wanted to show support for a new venture set up by my blogger friend, Sonel. I hope you will, too! 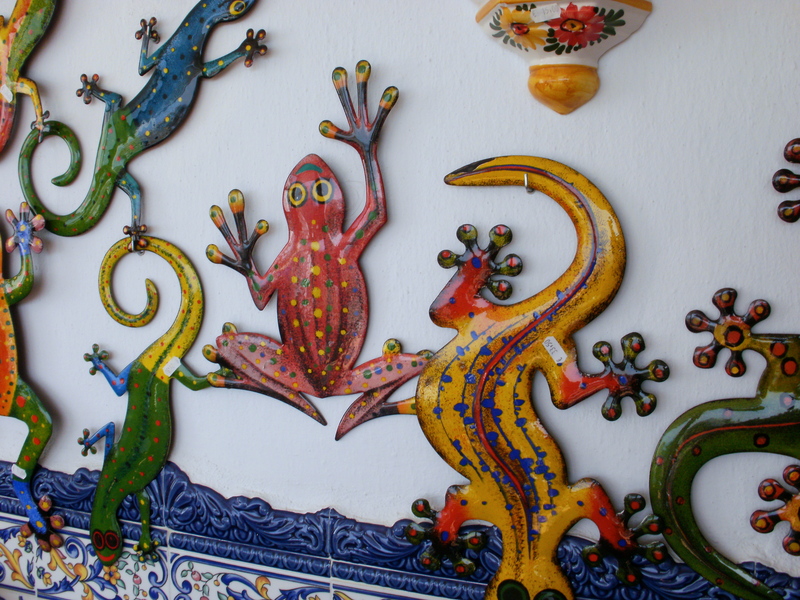 These colourful items were for sale in one of the little tourist shops in the pretty village of Frigiliana. But you also get a glimpse of the beautiful tiles adorning the lower part of the wall on the outside of the building.